The Odinic code is natural, life-affirming, and noble, and very often in direct contrast to the Judeo/Christian code. This is seen in many examples, but for the sake of space let us look at just one - PRIDE. When our faith was supplanted by the alien creed from the Levant and its later outgrowth, materialism, our Gods did not cease to exist, but our people ceased to recognise them. Though buried beneath layers of poison, the roots of our faith remained. Odinism is not a rigidly dogmatic religion. Many approaches to our faith exist, and function side by side, but there must be recognisable parameters within which it operates or our identity is obscured or lost. 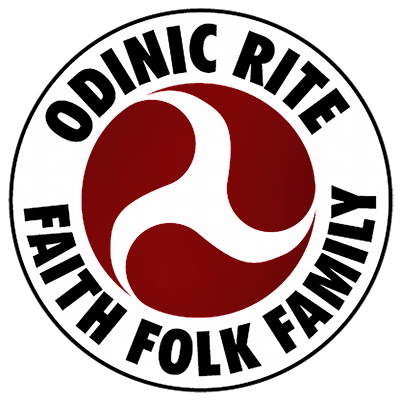 The Odinic Rite celebrates our own unique Folk Faith, and in present day society its existence is in itself something to celebrate because it affirms that against huge odds our Holy Faith has never died. ODINISM is one of the few religions that has not altered its beliefs to fit in with current fashion. The universalist religions, on the other hand, tend to change their spiritual principles in order to accommodate people of widely differing background and culture and in many ways the modern Christian church appears to be more of a political institution, with its ethical values being more political than spiritual in nature. OF ALL the doctrines of the Christian church it is the Incarnation which, the Christians themselves boast, distinguishes theirs most from other religions, both monotheistic and polytheistic. The Incarnation describes the Christians' belief that a god came down from heaven to earth and became a man. Agnosticism, of course, is not a wholly unreasonable viewpoint, just the result of a false line of enquiry. The agnostic attempts to assess objectively the merits of the believer's faith in the existence of god or gods by examining the evidence. He concludes that since a god cannot be apprehended by man's physical senses no evidence with any bearing on the question is available. He says, 'seeing is believing. I do not see. Therefore I do not believe'. Heimgest CG urges us not to rely too much on academia to the detriment of the natural essence of our faith and suggests that although an 'outsider' may have extensive academic knowledge of Odinism, or an aspect of it, this can never equal the inner, intuitive knowledge and appreciation that comes from a person actually and directly experiencing our living faith. WITH every advance in science the order that exists within the physical universe becomes more apparent. Nothing is haphazard. And it becomes increasingly difficult for any thinking person to dismiss a metaphysical dimension to the universe. As we have seen in previous articles including part 1 of this work, our mythology is applicable on various levels of reality and understanding. At a profound level it is an illuminated guide to our own individual evolution to more highly evolved sates and levels of consciousness. A path we progress upon over many lifetimes until we achieve the highest state of awareness, which we may call Odin Consciousness.